A Florida man said he was punched in the face and dragged 30 feet with his arm trapped in a car by a man who was angry over the fact he had a Trump flag in his front yard. The incident occurred in Boynton Beach on July 4th as Jeff Good watched a fireworks display from his driveway at around 9:30pm. An older man with gray hair and his female companion drove up and began yelling about President Trump and demanding Good remove the Trump flag from his yard. 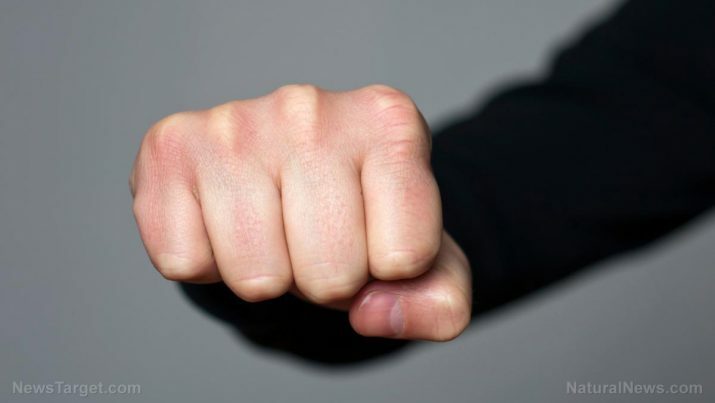 When Good refused, the man allegedly punched him in the face. Good tried to punch back, but the man immediately drove off with Good’s arm still trapped in the car. Good says he was dragged for about 30 feet and showed local news channel WPTV the bruises to prove it. “My political goal here is just to express my love for this president and for somebody to punch you in the face for just presenting the flag to the public, that is enough said right there,” said Good, adding that he thought he was lucky to get away with minor injuries. Boynton Beach police are asking anyone with information about the incident to come forward. The car was a small two door silver model. The incident is yet another example of physical abuse and harassment that Trump supporters have faced since Maxine Waters called on leftists to harass Trump administration officials. They include a teenager who was assaulted and had a drink thrown in his face at a Whataburger in San Antonio for wearing a MAGA hat, which the culprit subsequently stole. Last week, a Berkeley man was charged with making death threats against Rand Paul and his family, vowing to chop up the Kentucky Senator’s children with an axe. Earlier today we also reported on how Harvard law professor Alan Dershowitz was told by a woman that she wanted to stab him in the heart because he didn’t support impeaching Trump.